If you are an avid follower of the global warming issue you may be familiar with the "Hockey Stick" graph, a graph showing one thousand years of temperature highs and lows and averages from the years 1000 to 2000. The graph got its name from the shape of the average temperature line, which does indeed resemble a hockey stick (pictured at right). The graph shows that, after hundreds of years of relatively stable Northern Hemisphere temperatures, sometime after 1900 temperatures started rising and rose dramatically starting in 1990, leading to naming the 90s the "hottest decade ever." The Hockey Stick graph is the product of one Michael Mann, who at the time the graph was produced in 1999 was a professor of environmental science at the University of Virginia, and has since moved to Pennsylvania State University. Without getting into minute details, Dr. Mann of necessity had to estimate temperatures for that period prior to the time thermometers were invented and before temperatures were recorded and tracked through a process known as "proxy" methods. In about 1850, scientists started recording and observing temperatures at locations around the globe, making reported average temperatures more authoritative over the last 150 years. Dr. Mann testified before the US Senate in 2003, where he said that it is the consensus of the climate research community that the warming during the late 20th century cannot be explained by natural factors, but is due to human influences. 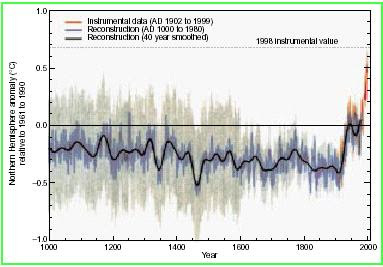 It takes just a little curiosity to find information that causes a normally intelligent person to question Dr. Mann's assertion, such as the fact that after he constructed his Hockey Stick graph a well-known and widely accepted Medieval Warm Period had disappeared. Even the UN International Panel on Climate Change originally acknowledged the existence of the MWP, until 1999 when Mann's Hockey Stick graph emerged and the IPCC accepted Mann's data. However, the most egregious act committed by Mann is the convenient overlooking of a giant alteration in the data gathering process, illustrated by Ross McKitrick, an economist who examined Mann's data and in doing so discovered some interesting facts. In 1989 there were approximately 12,000 temperature observation and recording stations reporting data for the derived "average temperature." Thousands of those recording stations were located in the USSR in 1989. But in that same year the USSR began to unravel, unleashing political and social turmoil that eclipsed the need to keep track of temperatures, and those stations ceased operating, as did others in other places. Many of those stations were located in Siberia, one of the colder places on Earth, and by 1990 the total number of measuring stations had dropped to approximately 8,000, and by 1991 to fewer than 7,000. By 2000, the number of measuring stations stood at fewer than 5,500, which is less than half the total only 11 years earlier when Mann claims the heating cycle began. It is more than a curiosity that the average temperature increased from about 9.7 degrees Celsius in 1989 to about 11.7 degrees Celsius in 1990, and the cause is no mystery at all: with fewer measuring stations overall, and particularly with fewer of them in frigid Siberia, how could this biased data fail to show a temperature increase? This column was written not to expose environmental hoaxes or faulty science, since the fallacies present in the conclusions contained in the Hockey Stick graph have been known for a while. It was written because virtually all weaknesses and failings in the man-causes-global-warming theory are covered up by advocates of this fallacious theory and news media that are friendly to this cause. “Ends of the Earth” / End of the Earth?